Eric Van Johnson, John Congdon, Jennifer Wadella, and Oscar Merida are featured in the first episode of 2019. Share your thoughts on the topics covered and leave a comment below. You can read Jennier Wadellas’ There Are No Snow Days When You Work Remote article in the January 2019 issue. Eric and John discuss learning about how the OPCache works, working with Jenkins, being a remote worker, and diving into PHP internals. Oscar talks lessons learned when adding AWS S3 service to phparch.com. 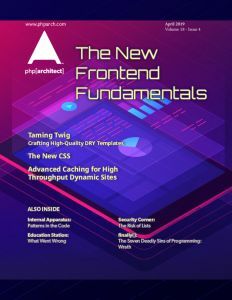 He also describes the all-new approach to tracks and speakers for php[tek] 2019.